Jim Sundberg’s favorite pic with four buddies and MLB catchers. 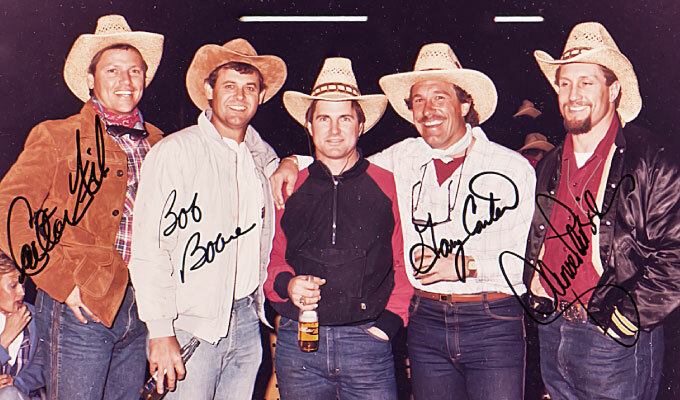 HOF Carlton Fisk, Bob Boone, Jim Sundberg, HOF Gary Carter and Lance Parrish on a Nike trip in Arizona. This picture represents catchers who combined for over 10,000 games caught in Major League Baseball history. Jim Sundberg is best known for his thirty-five years in major league baseball, sixteen of those years as a player for the TX Rangers, KC Royals, Chicago Cubs and Milwaukee Brewers. In 1985 he won the World Series Championship with the Royals and was voted “World Series Hero” by the Chicago Sports Writers. He is a 6 time Gold Glove winner and 3 time American League All-Star catcher. The Texas Rangers made him the namesake and first recipient of the team’s annual “Jim Sundberg Community Service Award” for outstanding work in the North Texas area. After his playing career, Jim transitioned into roles including award winning TV Broadcaster, Coach, Business Owner, Author of How to Win at Sports Parenting, Foundation President, and Senior Executive Vice President for the 2010 and 2011 A.L. Champions Texas Rangers. Jim currently enjoys retirement – spending his days writing, consulting, public speaking and traveling to see his 3 children and 9 grandchildren. Learn more about Jim on Wikipedia!